Painted Cast Iron Clown Carnival Gallery Target. 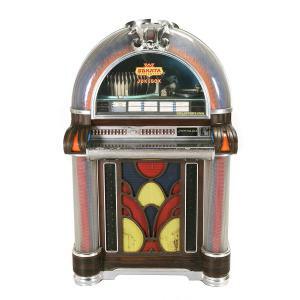 Sonata 1050 Jukebox with Records. PST. Culled from fine estates and curated by Michaan’s specialists, the sale’s highlights include rare original Coca-Cola tin trays, antique arcade and carnival games, vintage postcards and a Regina upright music box. it retains its beautiful color overall and shows only minor signs of wear after more than a century. Like most of the trays, it features the image of a fresh- faced young woman in period dress. An intriguing detail is the decoration of the inside rim with images of exotic kola nuts and leaves. These recall the Coca- Cola brand’s early promotional campaigns, centered on the drink’s healthfulness and its promise to “relieve fatigue.’’ The rare and lovely piece is estimated at $60,000-$80,000. The sensational popularity of the Coca-Cola brand and its ubiquitous advertisements made a star of young Hilda Clark, an American music hall singer and actress who became “the face of Coca-Cola” at the turn of the twentieth century. A 1901 tray featuring Hilda Clark’s portrait is offered at $3,000-$5,000 in the February 11 sale. 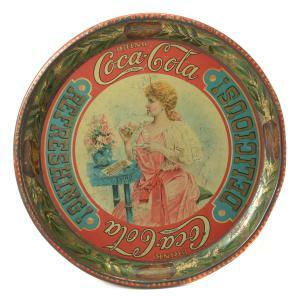 The auction includes more fine trays of various shapes, sizes and vintage, all from a single Coca-Cola collector. The Coca-Cola brand’s iconic status and the bold graphic appeal of its logo inspired the preservation not only of tin trays but also of every promotional item produced by the company. Signs, thermometers, glassware, wooden bottle crates and many more original finds await Coca-Cola collectors at Michaan’s. Carnival and arcade memorabilia enjoy a huge following, as shown by the overwhelming response to Michaan’s special September 2018 auction of “Playland-Not-At-The-Beach.” At this phenomenal sale, longtime and budding collectors competed over relics of bygone amusement parks, circuses and arcades. February’s Ephemera and Memorabilia Auction includes many highly sought items on this theme. 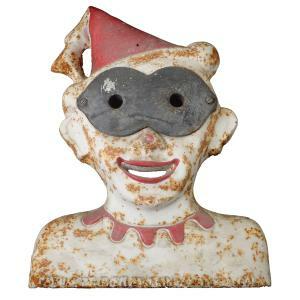 A top highlight is the cast iron clown carnival gallery target, manufactured by J.T. Dickman of Los Angeles on September 19, 1911 (per markings on the piece). With his jaunty tasseled hat, ruffled collar and black eye mask, this painted red and white clown bust gives a nod to Pierrot but with an all-American pedigree. Measuring approximately 20 x 15 x 5 inches, the cast iron clown is estimated at $8,000-$10,000. Old arcade games and machines have enduring appeal. Often featuring patented innovations, they are marvels of manufacturing as well as cultural artifacts. Included in the February 11 sale is the pop-up baseball game in a glass cabinet with wonderful period graphics, by Marvel circa 1940 ($200-$400). Shooting games and gumball machines are offered. Among the countertop arcade machines are several mutoscope motion picture devices, including one in working condition with “The Runaway” reel ($400-$600) and another with a Charlie Chaplin reel ($500-$800). Long before the selfie there was the 5 cent arcade machine “Do You Dare? See Yourself as Others See You” ($800-$1,000). The coin-operated Art Deco-style “Weight and Fortune Scale” ($200-$300) may tell you more than you wish to know! And only one lucky bidder will take home the “Grandma Horoscope Fortune Teller” arcade machine ($1,500-$3,000 … for better or for worse, Grandma is not in working condition). $800. Several of the postcard vending machines dispense “Glamour Girls” and risqué cards. Collectible ephemera extend in infinite directions, making for an auction full of discoveries. The Fil-a-Liter coin-operated lighter fluid dispenser, marked with its serial number, is estimated at $800-$1,000. Several novelty Merchantman Digger Machines are offered, one in excellent working condition ($2,000- $3,000). Pedal cars, vintage fire extinguishers and cash registers are among the auction lots: once so common, now so collectible. Paper money is also included in this sale, some from the Civil War era. One rare auction lot comprises railroad stock shares issued in 1914 by China’s first railroad company (1,200-$1,500). Carousel animals occupy a special niche. Are they decorative art, sculptures, or amusement memorabilia? Widely beloved and highly sought at auction, they are featured in Michaan’s February 11 sale, each with a stand. The menagerie includes a giraffe ($800 – $1,000) sea horse ($2,000 – $4,000) and black cat ($800 – $1,000) as well as several handsome carousel horses. For the full catalog and auction calendar, please visit www.michaans.com.